Written by James C. Hsiung. Many in the West, particularly in America, have been concerned about a rising “new Sino-Russian alliance” since the end of the Cold War. President Donald Trump even explicitly named Russia and China, in the same breath, as “competitors” (read: rivals) in a 56-page statement issued on the 18th December 2017, outlining what some media called “a new Cold War-style” approach to U.S. foreign policy. To those in the know, however, the assumed alliance between China and Russia did not come about by their own choice, as the two nations have been at odds since the gruesome Sino-Soviet split began in 1957, during the Maoist era, and also well into the 1990s. Tensions only relaxed somewhat after Gorbachev’s goodwill visit to China in 1989. In the Post-Cold War geopolitical game, both nations were pushed by Washington’s policy into each other’s’ arms, as they counter-acted against U.S. attempts to undercut them. Below, I shall delve into how this “haphazard” alliance came about, thanks to U.S. pressures. Beijing’s loss in its bid to host the 2000 Olympics, due to U.S. obstructionism in September 1993, was a devastating experience, as China had staked its national pride on it. This was a devastating experience, as China had staked its national pride on hosting the event. Two months later, the Russian Defence Minister, Pavel Grachev, made a surprise visit and, while in Beijing, signed an agreement with his Chinese hosts to spur ministry-to-ministry defence cooperation. The U.S.’s post-1994 push for the expansion of NATO, to absorb all the post-Communist states in East and Central Europe, changed post-Soviet Russia’s initial “Atlanticist” outlook. In two years, Moscow turned inward and eastward. 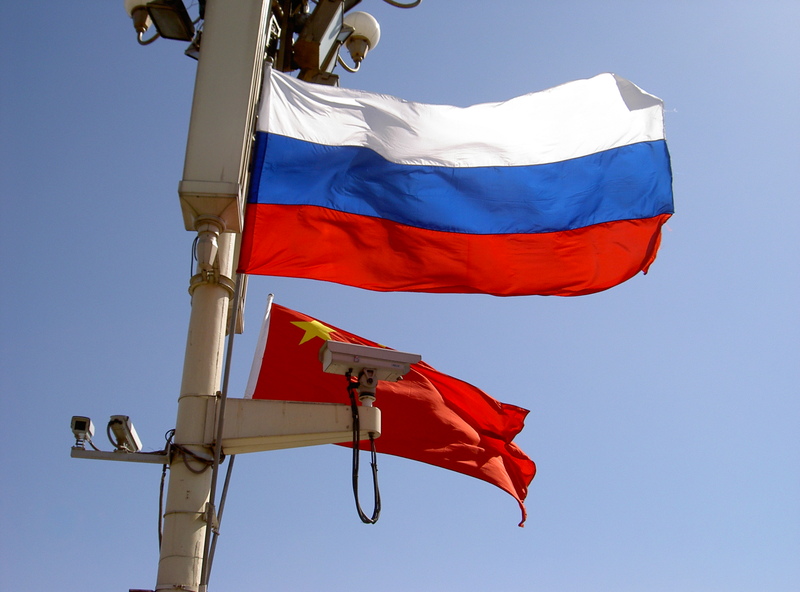 The pattern was set that the main initiative for the Russo-Chinese partnership would come from the Russian side. Initially, the Chinese were somewhat hesitant about warming up to Russia, because in their perception the political capital of the post-Soviet leaders in Russia, including Vladimir Putin, came mainly from the demise of the Communist Party of the Soviet Union (CPSU). They were unsure if Putin’s post-Communist reflex would not bias his attitude toward a China that was roaring under the rule of the Chinese Communist Party (CCP). The reverse may also be true; Putin may have apprehensions about the possible influence the CCP may cast on the nostalgic supporters of the former CPSU, should Russia become too close to China. A combination of events provided the impetus for the hastening pace in sealing a closer Russo-Chinese partnership. Russia was roiled by the sinister news in 1999 that followed the massive recruitment into NATO of former Soviet bloc members, from Hungary, Poland, Bulgaria, Czechoslovakia, Romania，to the three Baltic states. In addition to this expansion, the U.S. planned to negotiate for the establishment of a Theatre Missile Defense (TMD) system in Poland and the Czech Republic. The U.S. stated that this system would be aimed at Iran, Moscow was not convinced. China was having similar problems with the United States. It had to face stoically the new President George W. Bush’s $1.6 billion arms sales to Taiwan. Moreover, the U.S. in 1999 signed an agreement with Japan, to embark upon a joint research on setting up a TMD system in East Asia. To counter this, China filed a lodging protest, jointly with Russia. Beijing’s relations with the United States improved slightly after the 1st April 2001 U.S. spy plane incident off China’s coast. In addition, following the 9/11 terrorist attacks China offered positive support for America’s anti-terrorist fight. However, the die was cast for a closer than ever Sino-Russian partnership. The deepening bilateral ties can be summarized as being anchored on four pillars: (a) a bilateral Inter-State Treaty on Good Neighbourliness and Cooperation (GNC for short) signed in 2001; (b) the Shanghai Cooperation Organization (SCO, also hatched in 2001), consisting of four of the former Soviet republics in Central Asia (Kazakhstan, Kyrgyzstan, Uzbekistan, and Tajikistan) as well as Russia and China; (c) a Multipolarity consensus (2003); and (d) the creation of a New Development Bank (NDB) under the new BRICS grouping (formed in 2010). The SCO provided a vehicle by which the U.S. air force presence could be monitored (under contract with some of the ex-Soviet republics) in Central Asia. It has also since developed a free-trade association (FTA) among its members. Russia’s and China’s respective pet projects may dovetail to form the bedrock of a Eurasian integration. Russia has established the Eurasian Economic Union (EEU) in hopes of creating a Russian-led bloc, with geopolitical overtones. China, on the other hand, has promoted the One Belt One Road (OBOR), or New Silk Road, an initiative that aims at integrating 65 countries in Eurasia, by the use of Chinese financial power. The first steps of this project were building the infrastructure (e.g., fast rail links), to join 4 billion population together. The EEU and OBOR may provide competition for the European Union’s integration efforts. And, with Trump’s decision to withdraw from the Trans-Pacific Partnership (TPP) and his wishy-washy attitude toward the Transatlantic Trade and Investment Partnership (TTIP), the joint EEU-OBOR endeavour has the potential of isolating the United States as well. Although the effects of the EEU’s multilateralism have yet to appear directly threatening to the EU, cooperation with China’s OBOR could add a significant transit aspect to the EEU. Goods from China could move more easily to Europe via the EEU, passing just two, rather than multiple, customs checks. And, China’s rise as an economic power will make the smaller powers more relaxed about Russia’s presence as a political and military power. While the EU may secretly prefer to see a competition between Russia and China, it has proven difficult for that to happen. Ukraine and the resulting Western sanctions against Russia, for instance, only created an intense rapprochement between the two countries. It is most visible in the resumption of Russian sales of the S-400 missile defence system and the Su-35 planes to the Chinese. One indication of Eurasian economic integration at work is the spread of oil and gas pipelines from Russia, and Central Asia, to China and the surrounding areas in East and Southeast Asia. As in the European case, cooperation across Eurasia can start in key functional areas, like energy and transport, and then expand to more general forms of institutional integration, like the EU92 and beyond. As this is yet to happen, one thing is certain: Russia and China are destined to be the moving force behind the eventual Eurasian integration. James C. Hsiung—Ph.D., Columbia University, where he also taught, is Professor of Politics & International Law at New York University. He is author and editor of 25 books, in English alone, including his An Anatomy of Sino-Japanese disputes & U.S. Involvement: History and International Law (May 2015), and The Xi Jinping Era: His Comprehensive Strategy Toward the China Dream, (August 2015). His 25th book The South China Sea Disputes and the U.S.-China Contest: International Law & Geopolitics is due out in March 2018. He can be reached by E-mail at <jch2@nyu.edu>. Image Credit: CC by openDemocracy/Flickr.